We enjoyed this 4 day getaway as it gave us a break from the routine we have living in Abu Dhabi. 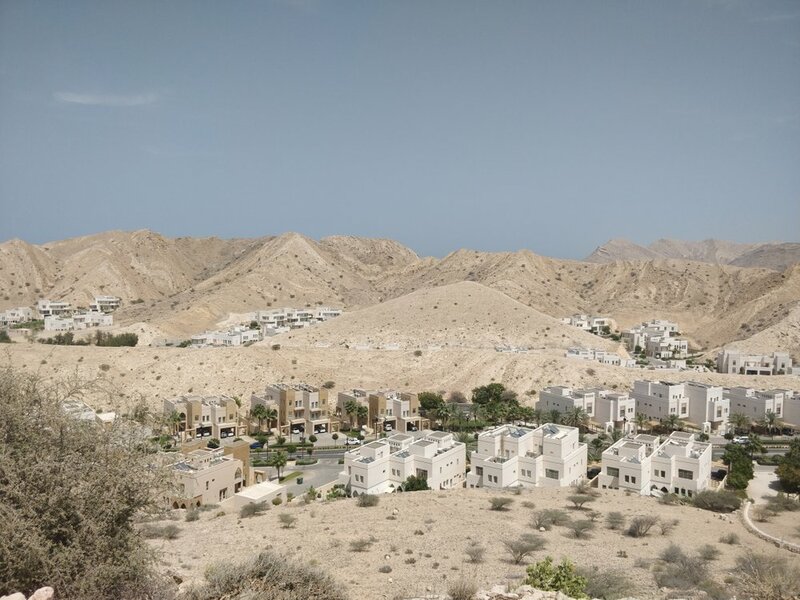 We got to experience a new country with amazing mountains everywhere you look, its kind, helpful locals and the quiet, peaceful life that we sometimes miss in Abu Dhabi. 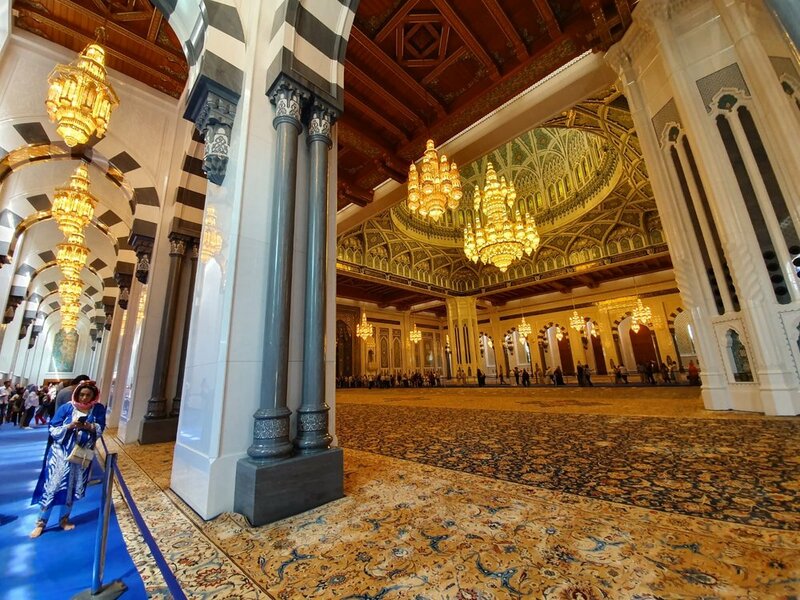 This might be a great trip if you have a long weekend coming up and you're living in the UAE. 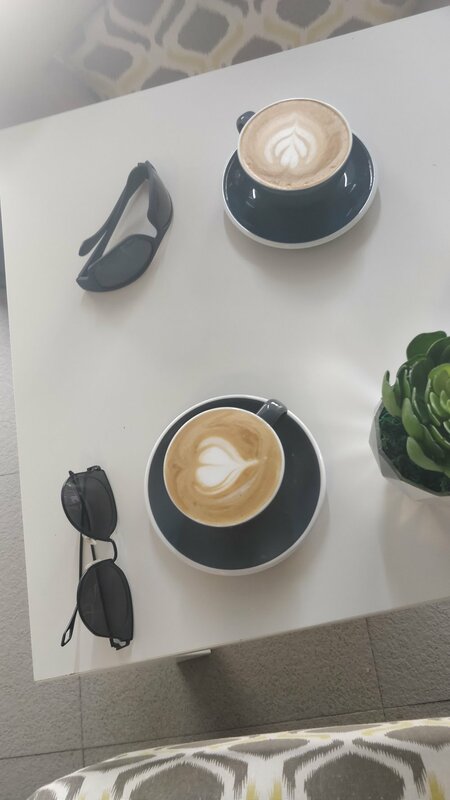 Read on to find out where we took it! The stop we didn't make: we wanted to stop in Nizwa to see the Nizwa fort, but didn't have enough time. Duration: 4 days or more. 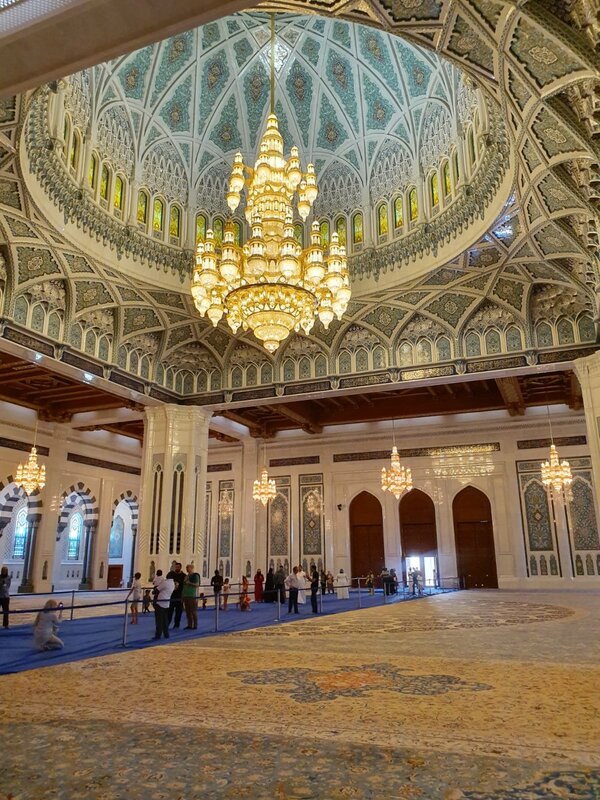 1 day for the drive there from Abu Dhabi or Dubai, 2 days to explore and another day to drive back. 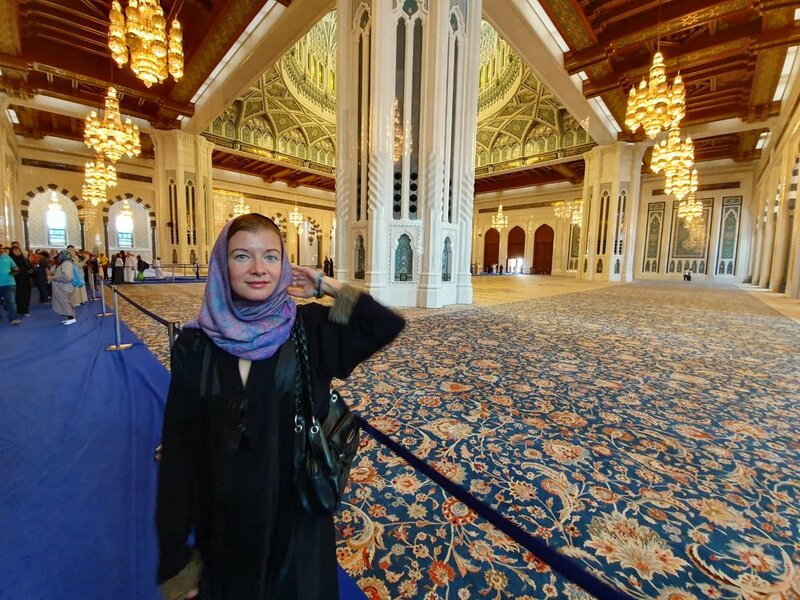 Oman is a Muslim country, so make sure to pack light, but not too revealing clothing. Short sleeved shirts and long pants (or under the knees) will do. You’ll also need a hat or a scarf to protect your head from the sun, sun screen, hiking shoes, sun glasses. Print the confirmation they send you back in an email, you will be asked for it at the border. 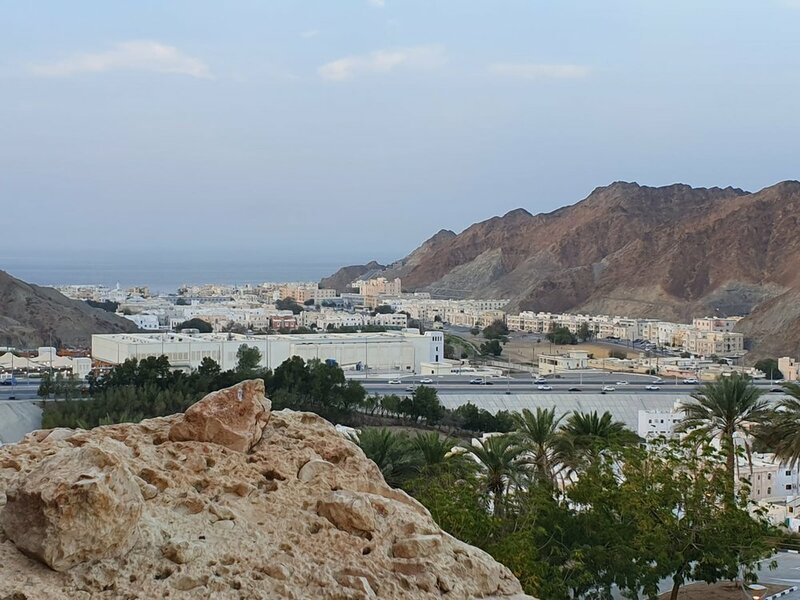 If you are driving a rented car, you need to go in to your rental agency and let them know that you want to drive to Oman. You will need to get extra insurance (ours was about 60 Eur) and they will give you a paper about the car in Arabic that you will need to show at the border. You also need to agree with them on the border crossing you are going to use. We went through Khatm Al Shikla border both ways. We got local currency out of an ATM at the border office, but it might be easier to get some in the UAE in an exchange office. 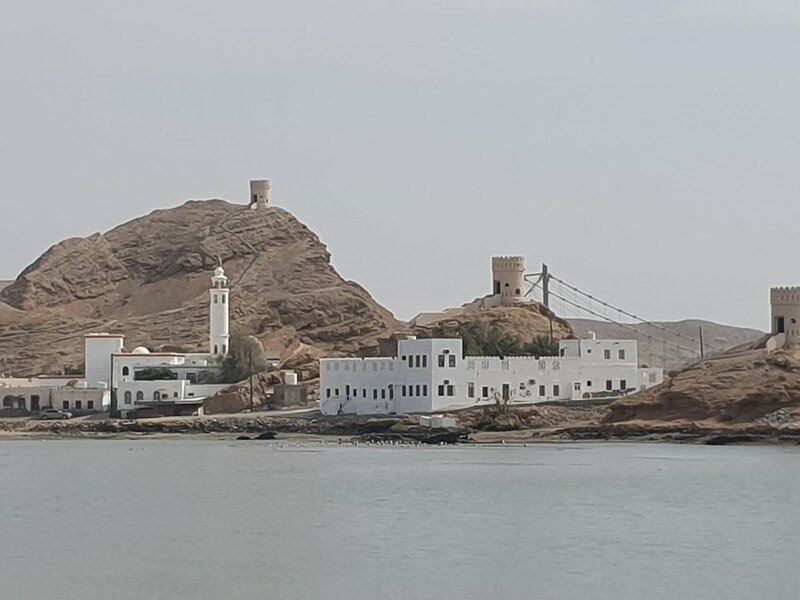 We took out about 121 Eur, which is 50 Omani Rial, and that was just enough for 4 days, we only paid by card for our accommodation. With an early start from Abu Dhabi at 7 am on Wednesday, we arrived at the border after 3 hours. There were no difficulties and the process was quite quick. You will need to go into the border office to get your passport stamped. There is a tourist information office, an ATM, toilets and you can refill your water bottle here too. 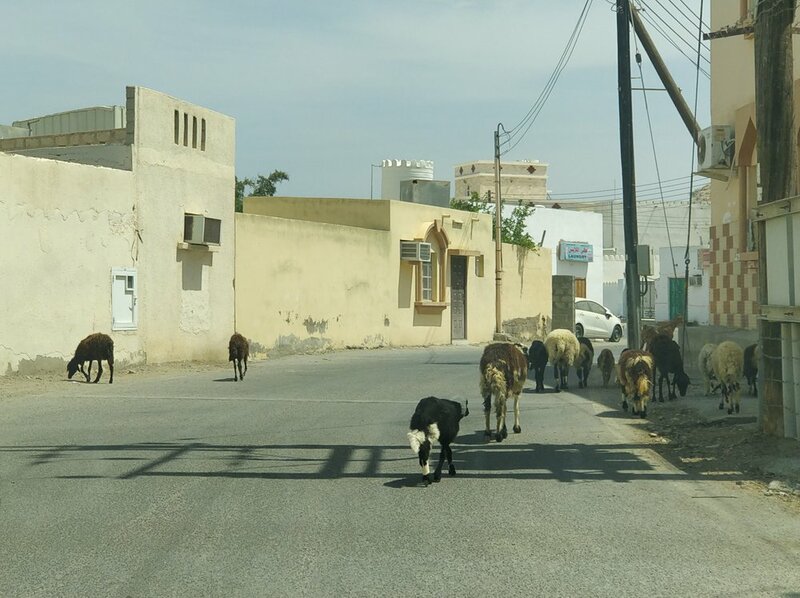 After crossing the border we headed towards Muscat, but as it was still a long drive we stopped for lunch in Sohar, a quiet town with a seaside promenade where we went for a short walk. 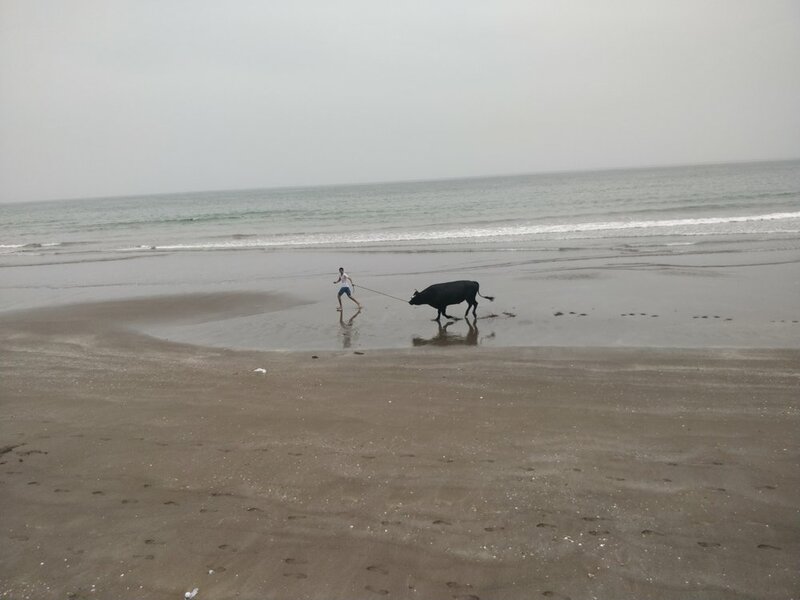 Some kids were casually walking their bull on the beach here. Lunch was at a random restaurant on the side of the road towards the centre and we were surprised at how cheap the food was, paying about 8 Eur for 2 courses for the 2 of us including drinks. 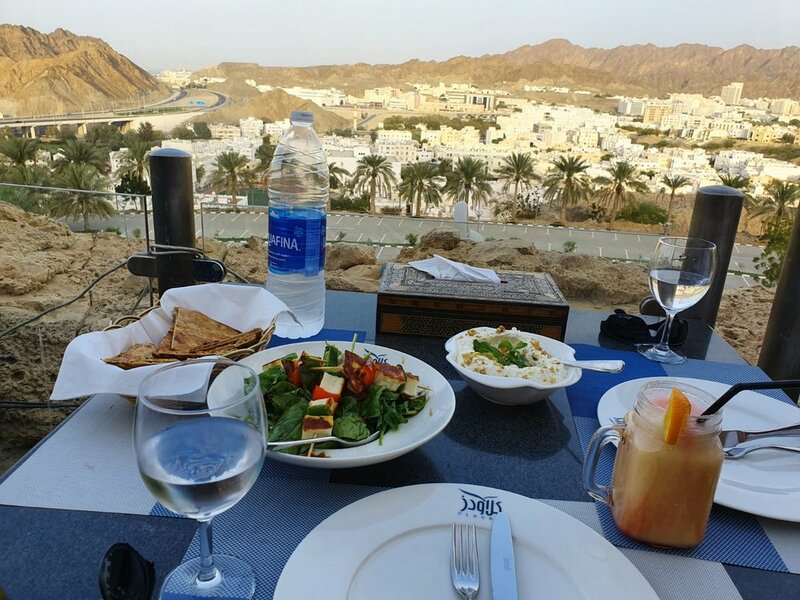 Of course Muscat is more expensive, so if you want to save a bit it’s worth stopping by in one of the smaller towns for food. We got to our hotel in Muscat at 3:30 pm, ready for a long nap. We stayed at Delmon Hotel Apartments, 30 Eur/night including breakfast. 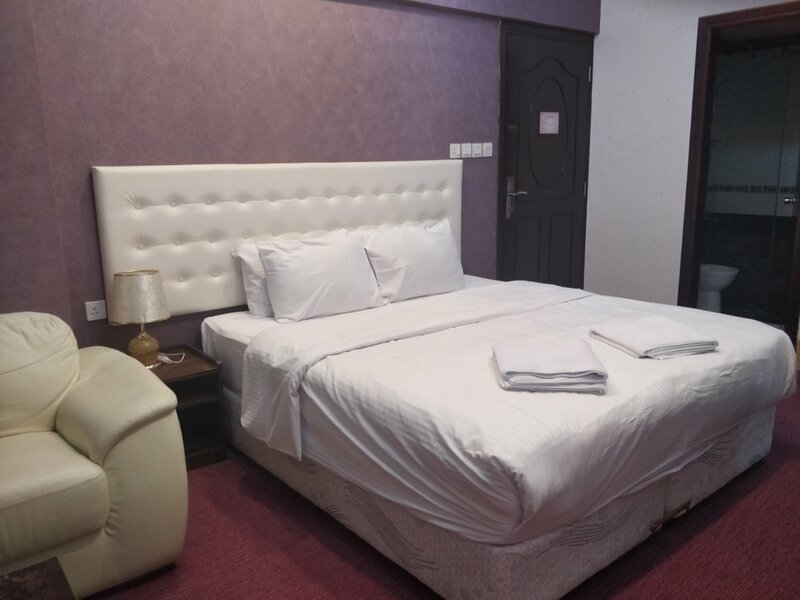 The hotel was average, nothing special but good enough for our needs. We had a comfortable, clean bed, aircon, shower and a small fridge. After a rest we went to The Cave, a complex of 5 restaurants in a man-made cave. It’s built on a hill, so there is an amazing view on the city from The Cave. Be careful if you are using GPS to get there as it will navigate you to a dead end. The Cave is right off the main road, just follow the signs along the road to get there or ask the locals, don’t listen to the GPS. 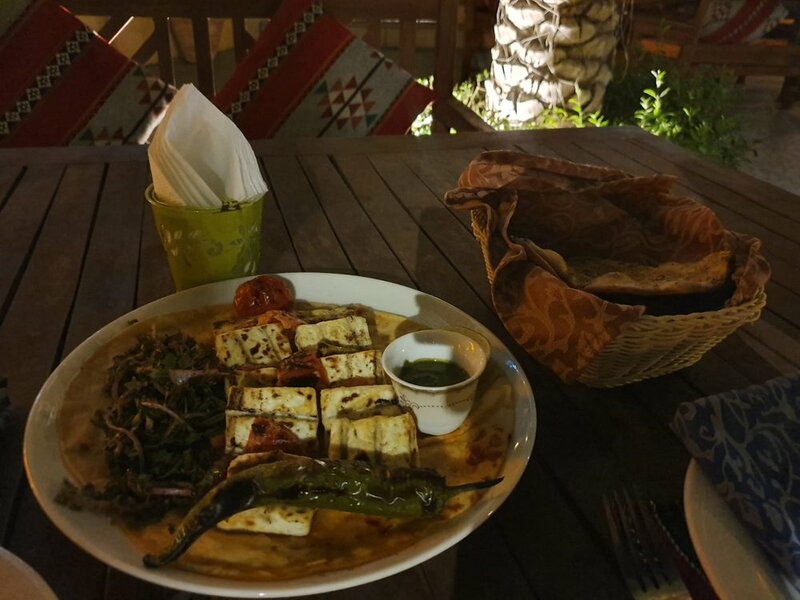 We tried the outdoor Indian/Mexican restaurant the first evening. We had haloumi cheese and a drink each. They serve alcoholic drinks at this restaurant too. 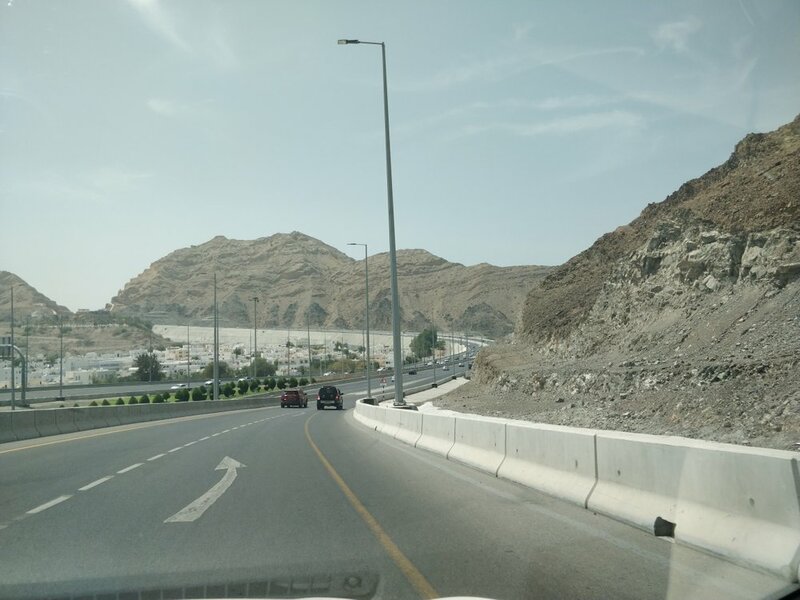 We used our rented car to get to the sights we wanted to see in Muscat, the GPS worked quite well with a few flaws. Traffic isn’t too heavy and it’s not difficult to get around, but if you don’t want to drive, you can also get a taxi. 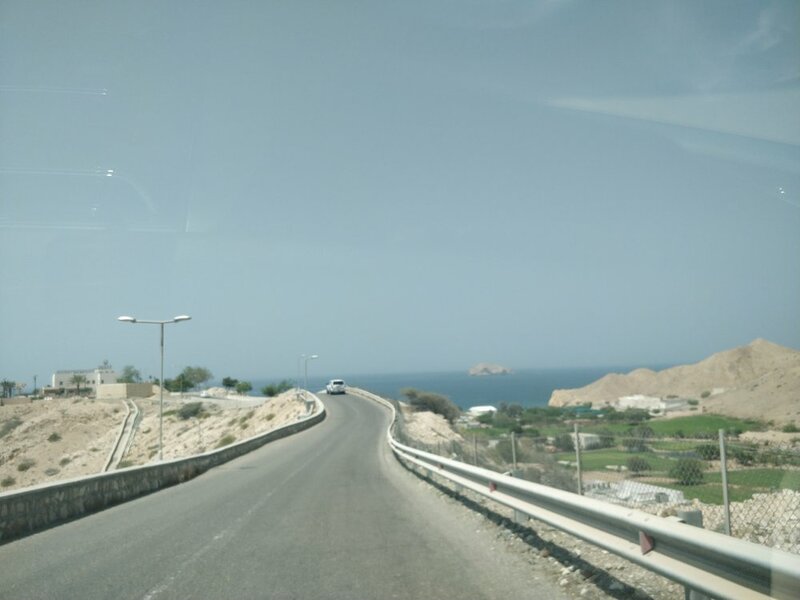 Muscat has some amazing views and we couldn't get enough of them driving around the city. 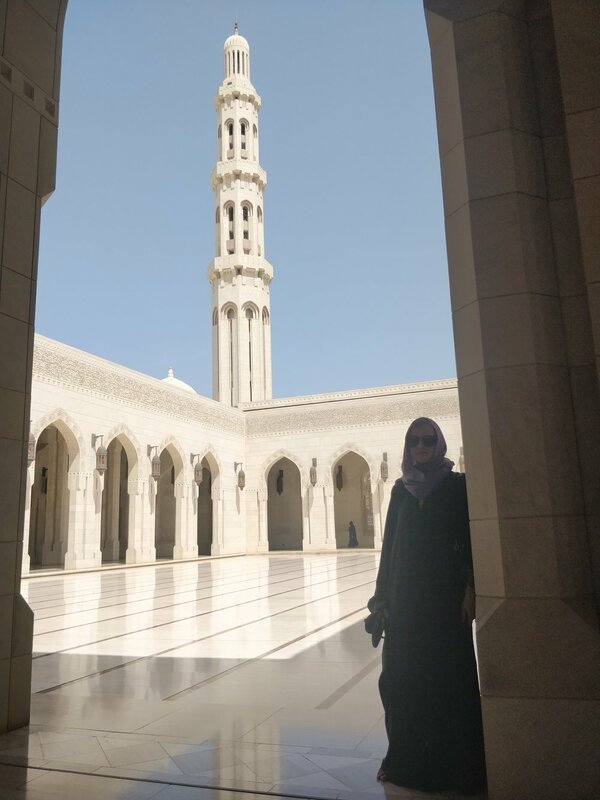 We started the day with their most famous Grand Mosque, which is the only Mosque in Oman that allows Non-Muslim visitors to enter between Saturday – Thursday, 8:30 am – 11 am. You will need to wear long sleeves and long trousers, and women have to cover their hair. 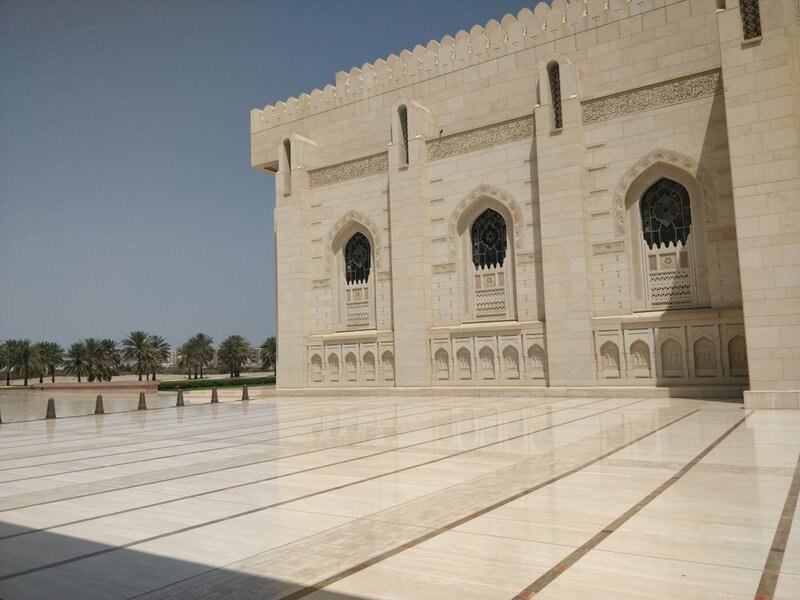 If your clothing is not appropriate, you can rent an abaya or a white robe for men at the entrance for 2.50 OMR or from the taxi drivers parking nearby for 1 OMR. After the Mosque we drove to Mutrah Souq, one of the oldest Souqs in the Arab world, located just off the Corniche, Muscat’s promenade. The best spot for parking here is in front of the fruit and vegetable market, right at the roundabout opposite the Souq, it’s free and you’ll always find a spot to park. At the Souq there are lots of little shops inside, selling mostly the same: incenses, 'antiques', and textiles. Surprisingly, it’s not as cheap as I’d have thought. A scarf here could cost anywhere between 5 and 15 Eur. It’s easy to get lost in there as all the little streets look the same. Vendors are quite pushy so you have to be firm with them. Make sure to bargain before you buy anything. 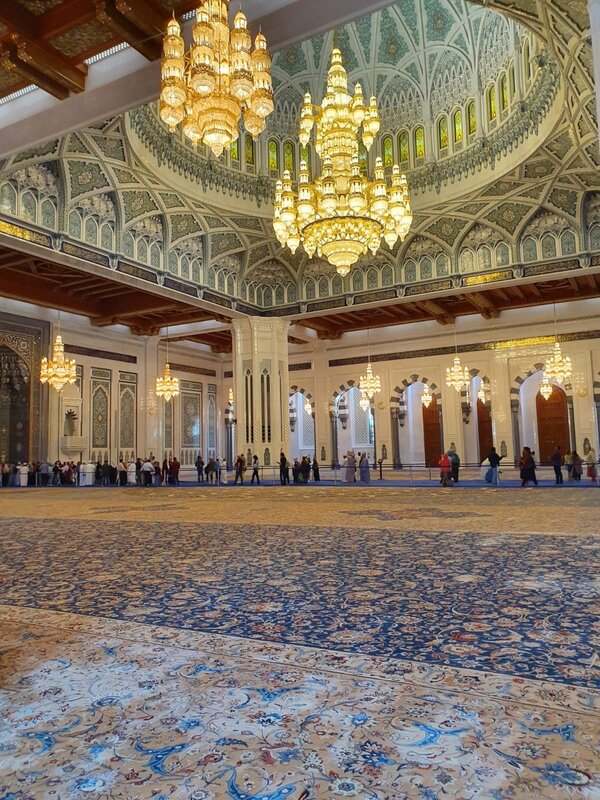 The smell of all the frankincense and other incenses is amazing, the Souq is worth visiting for that on its own, but the crowds can be overwhelming, we were there on a Thursday and it was very full of both locals and tourists. We had some coffee in one of the cafes outside the Souq and walked along Mutrah Corniche. It has a nice view at the port and the mountains. 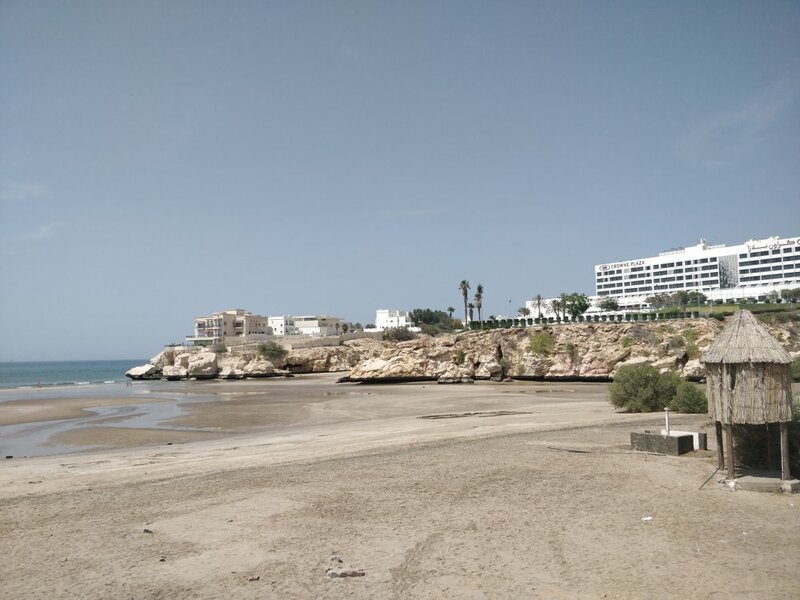 After all the shopping and sightseeing we were ready for some beach time, so our third stop was Qurum beach, which is probably not the best beach in Muscat, we chose it because it’s easily accessible, has free parking and there are cafes on the promenade. 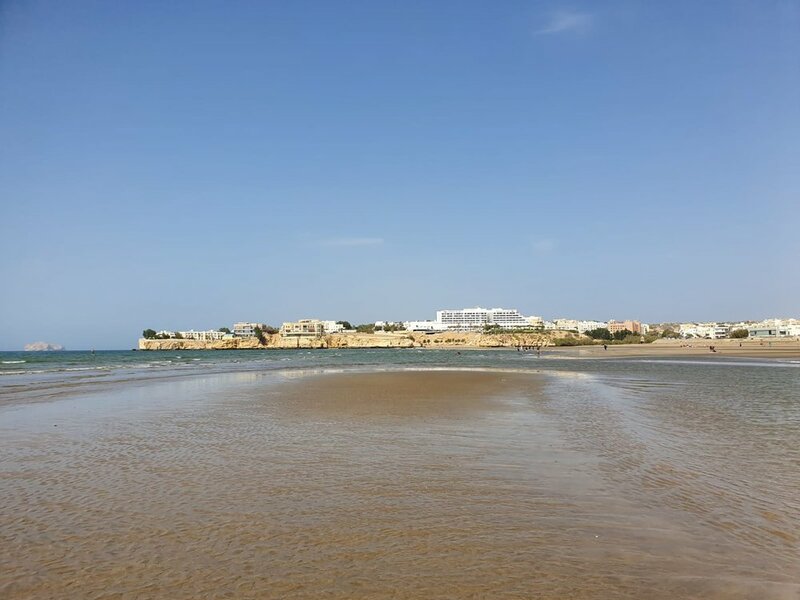 It has a 2 km long stretch of sand, and we had a pleasant walk along the beach after a cold drink at one of the cafes. We went back to the hotel for a short rest and then headed off to The Cave for our second round, this time to the Egyptian restaurant on the 1st floor. This place doesn’t serve alcohol, but their food is very tasty. This was the only restaurant open in the early evening, all the other ones in The Cave close between 3:30pm and 7pm. This was the day we went to the amazingly beautiful Wadi Shab. 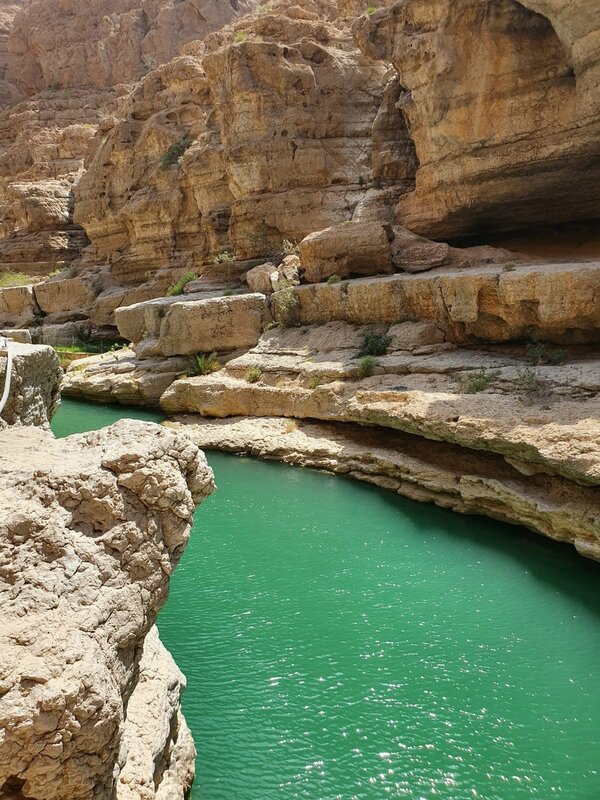 There are many Wadi’s is Oman, Wadi Shab being one of the most popular ones. 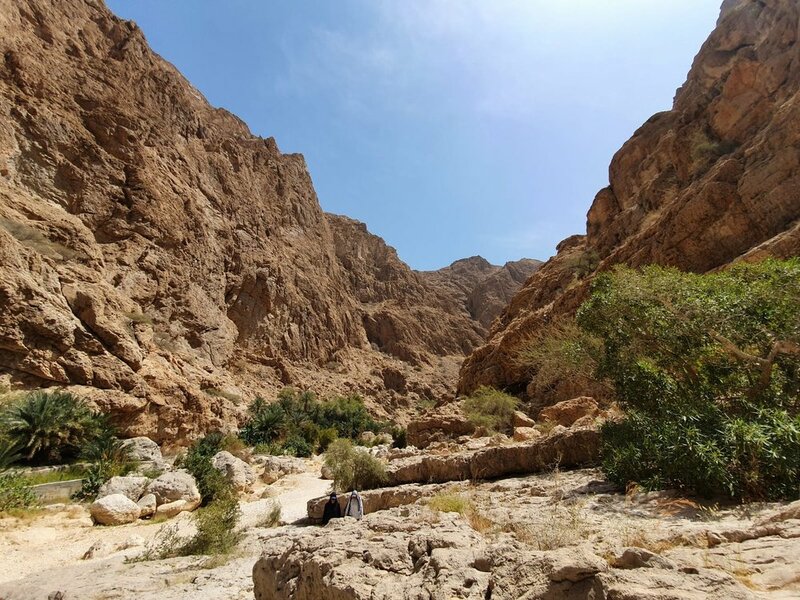 A Wadi is a dry riverbed running between the numerous mountains of Oman. 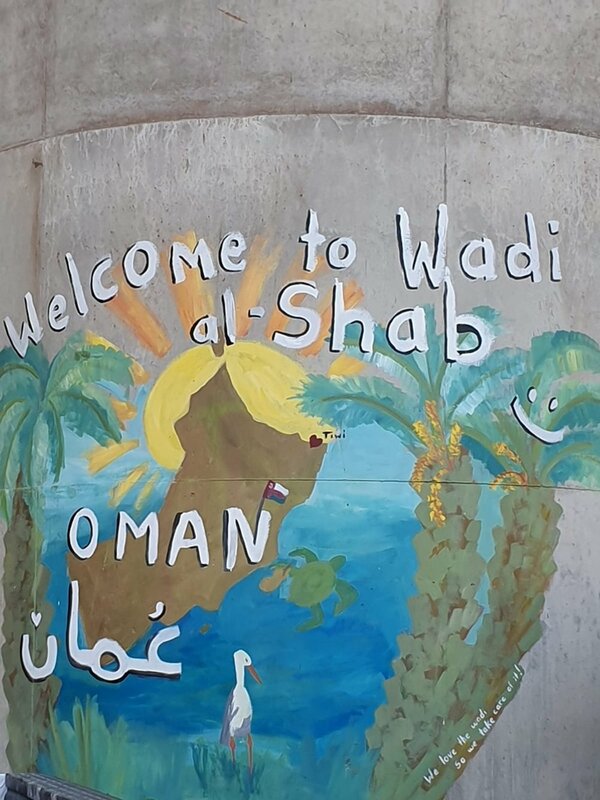 It is about 150 km from Muscat, 1.5 hour drive so we started off at 8am from our hotel, which was a good decision as the Wadi started crowding up in the afternoon. It’s a very easy drive, all along one motorway towards the south of the country, the GPS will get you there without problems. 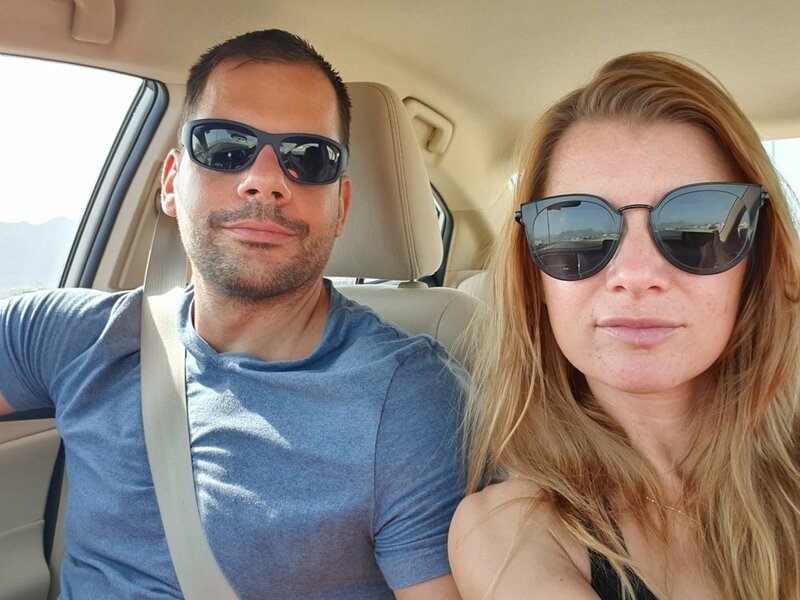 The only annoyance for us was the speed limit, which is 100 – 120 km in Oman, while we got used to a much higher limit of 140 – 160 km in the UAE. 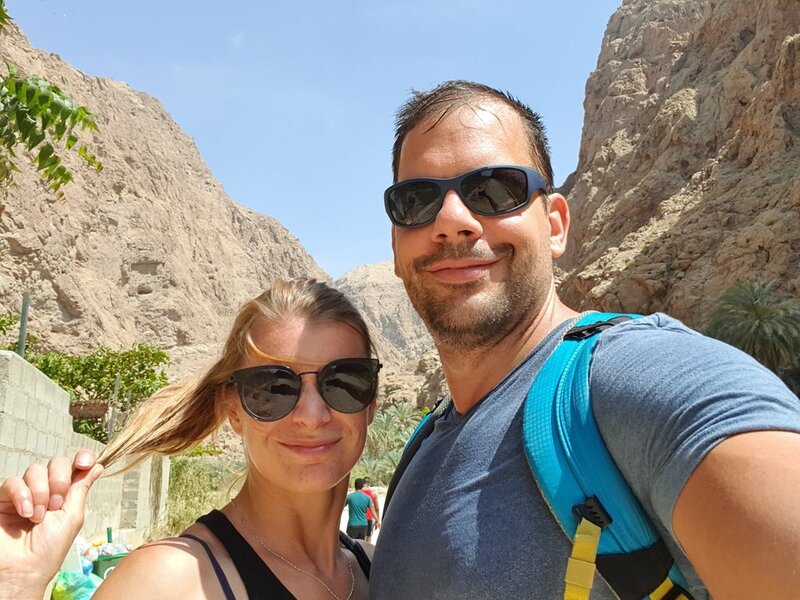 We got to Wadi Shab before 10 am, you will see a big concrete bridge at the start of it with a few little boats on the water. There are newly build public toilets and a lot of free parking available. 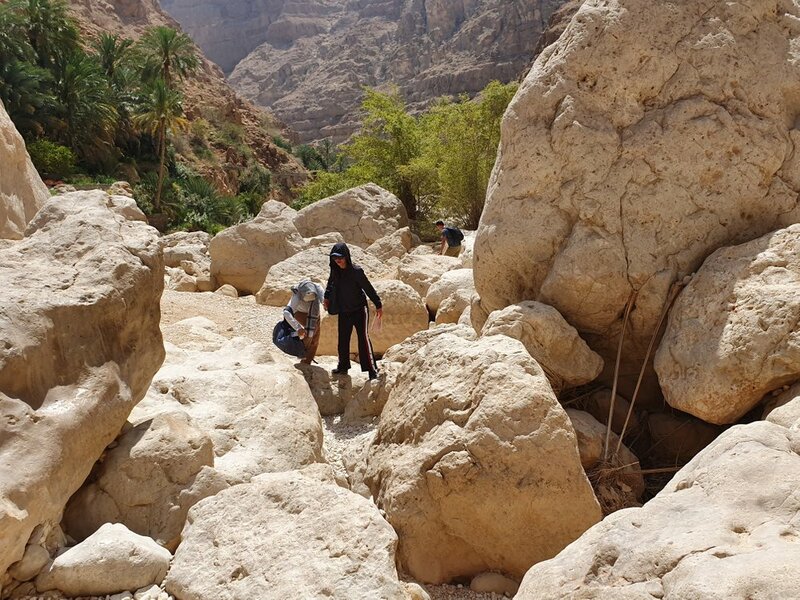 The locals will take you to the other side of the river, where the hike to the middle of Wadi Shab begins, for 1 OMR. You get a return ticket for this price so they’ll take you back to the parking when you finish your trek. 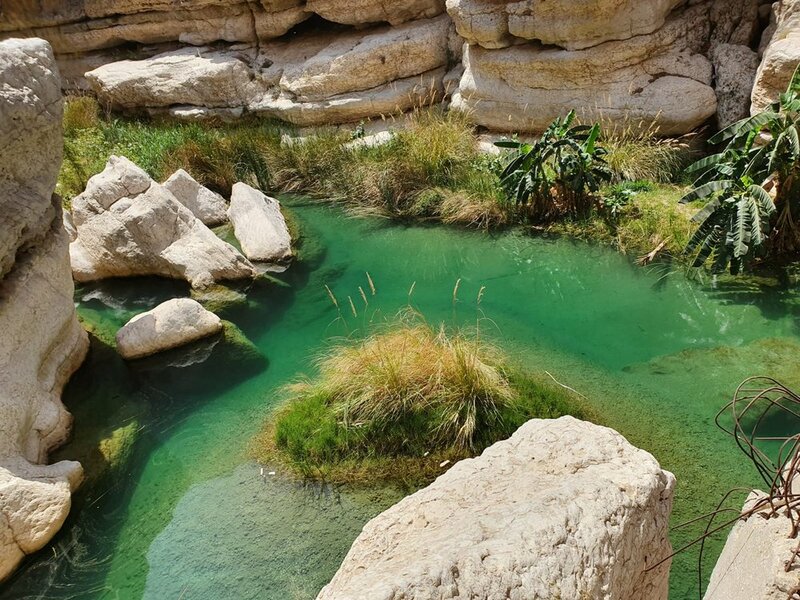 Once you get out of the boat, you’ll need to walk about 40 – 50 minutes to get to the main pools of Wadi Shab. At the beginning it’s an easy walk but it gets harder towards the end and you will have to climb a few rocks. The weather can also get quite hot, it was 40 degrees when we visited in April. You don’t need to walk to the very end and I wouldn’t recommend this walk for people with small children. There is a big pool after a 10 minute easy walk, we saw some people who didn’t go further than that. If you decide to go on, you’ll be amazed by all the beautiful mountains that engulf you everywhere around, with a few pools scattered along the way. 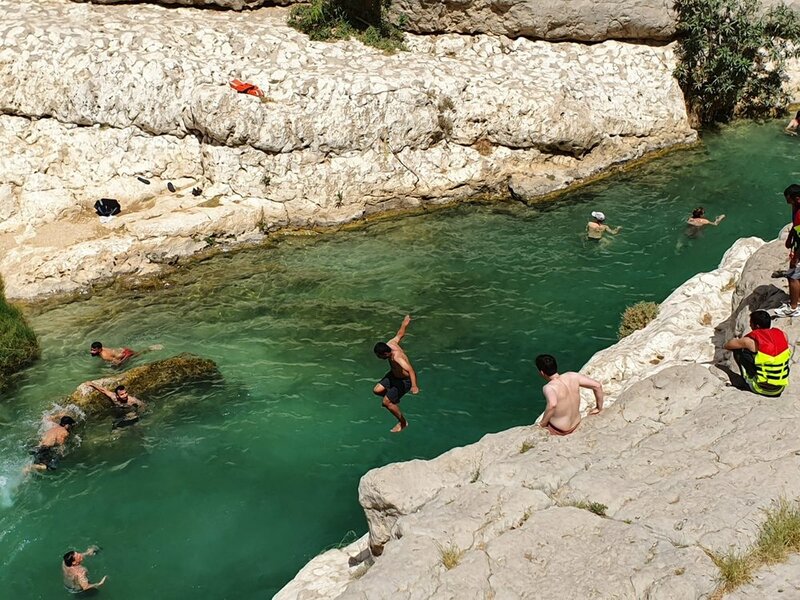 You’ll know when you get to the main part of Wadi Shab as everyone else will stop there, and there will be a huge pool in front of you. You can swim/walk through several pools, each of them being unique and of different depth. You will need to leave your stuff unattended at the first pool if you do that, but we saw everyone else doing that. Some people walk further on the side of the mountains, we decided to stay at the pools and refresh there. The walk back was much quicker, we made it back to the boats in about 30 min. 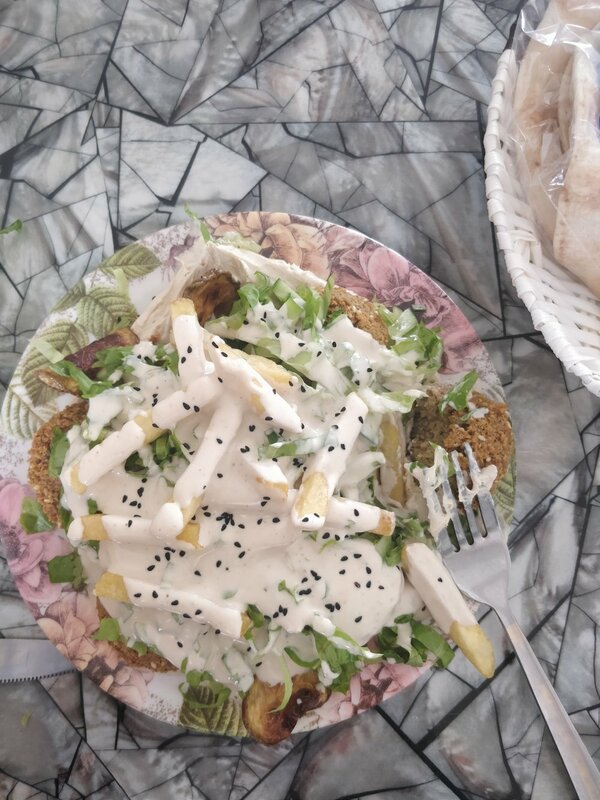 We stopped for lunch in Tiwi, the small village right next to Wadi Shab at a place called Restaurant of Traditional Dishes and we had a Biryani each. It was a simple lunch, good enough and not expensive. We had fun taking pictures of all the goats on the streets of Tiwi, they were just on their afternoon walk probably. 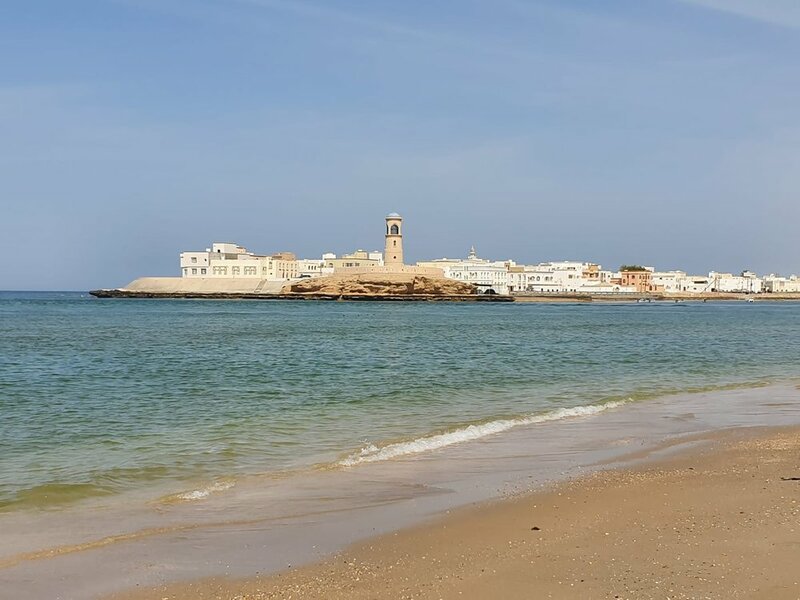 After lunch we headed off to Sur, a quiet seaside town 40 km further to the south. This town is quite spread out, and we visited the part called Beach Pavilion, which has a nice beach and a promenade. There is a lighthouse just opposite this beach, but it wasn’t overly impressive. 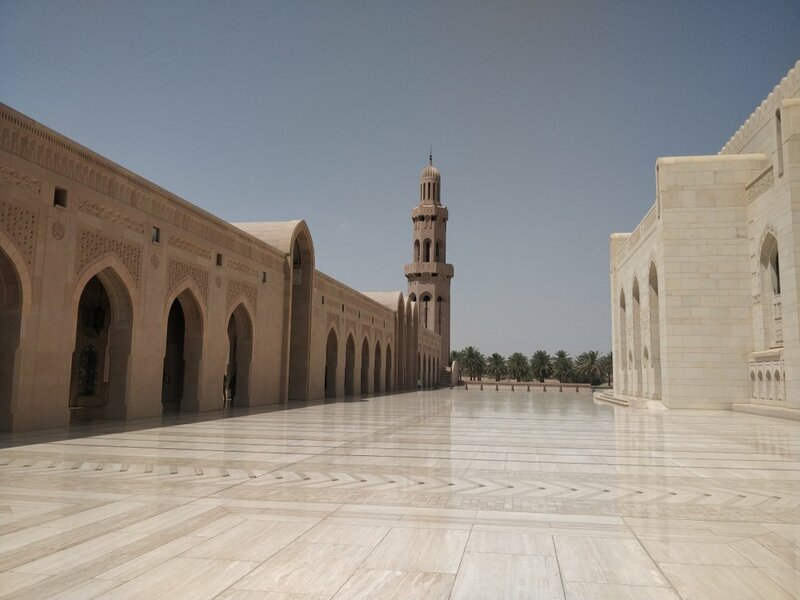 We liked the atmosphere in this town, it was very calming and sleepy, probably even more so because it was Friday (the main day off in the Muslim world). 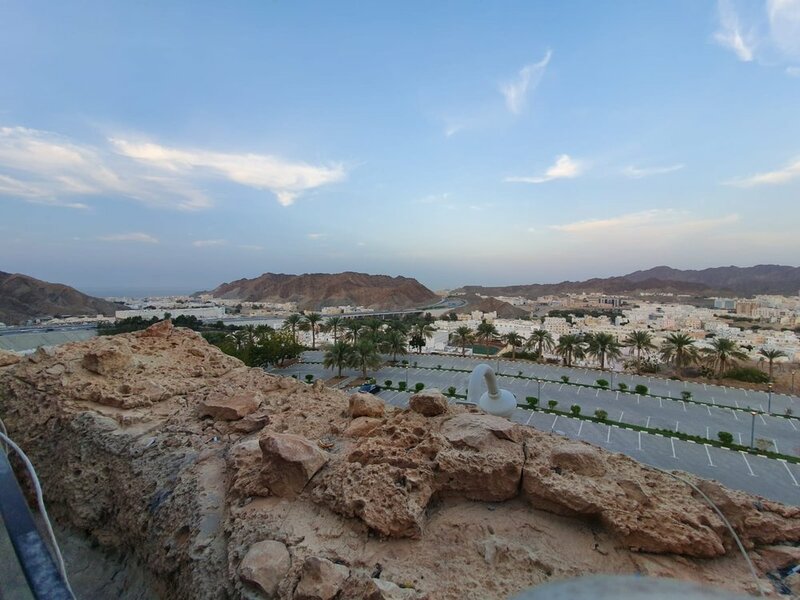 We were planning to stop at Nizwa fort on our way back, but we didn’t want to get back to Abu Dhabi too late so we decided to skip it. 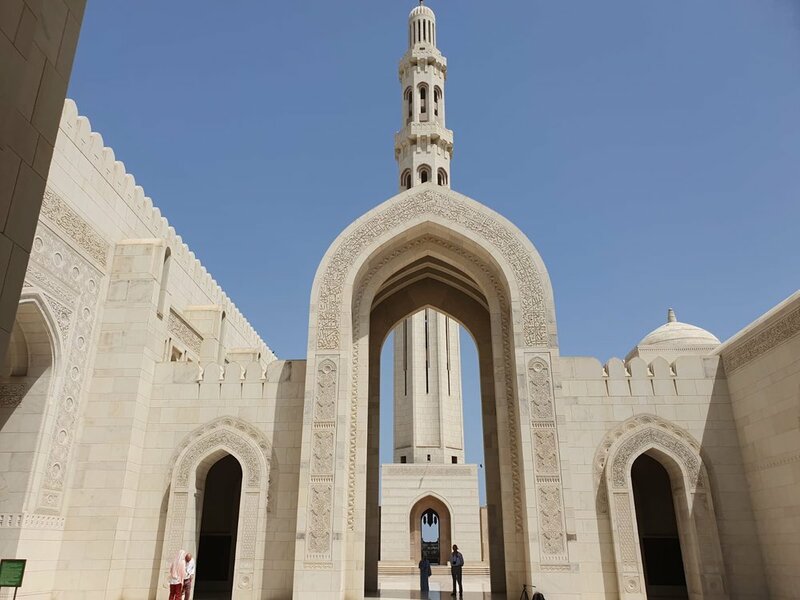 It might be an option for you, especially if you are only driving to Al Ain, which is close to the border with Oman, as opposed to Abu Dhabi and Dubai, which are another 3 hour drive from there. We enjoyed the beautiful mountains on the way. We started off from the hotel at 8:30am and got to the border around 11. Again we had to go into the same border office for another stamp, but we didn’t have any problems. If you are driving a rented car, be careful to enter the border name into your GPS that you want to use to get back into the UAE (the one you agreed with your rental office), because there are 2 borders not far from each other and they are not properly signposted. 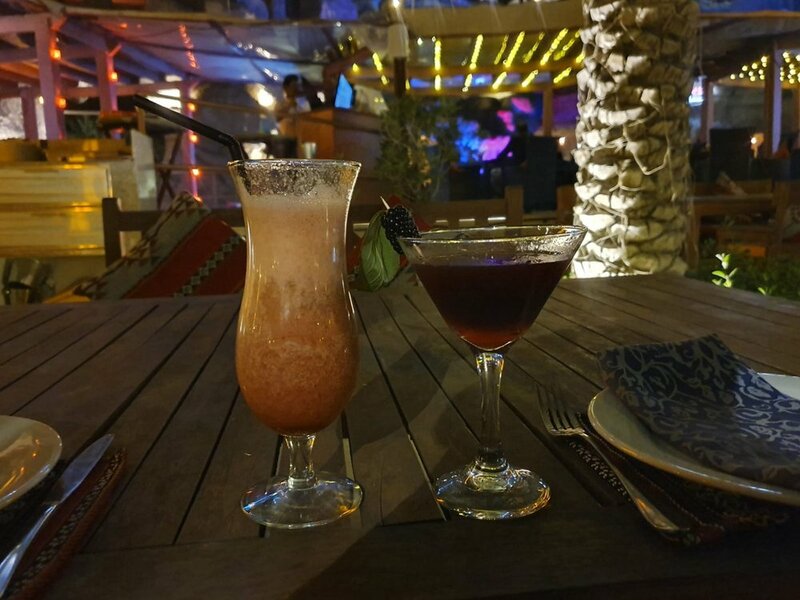 We got back to Abu Dhabi at 4:30pm with a lunch break we took at Al Ain Mall at our favourite restaurant chain, Shakespeare & Co.